Putnam County Aging Program | Proudly serving WV for over 35 years! Welcome to Putnam County Aging Program! When [Mike] comes in every day, he always asks me how I'm doing. He talks to me and I like that. I like the menu. The meals are a great help to me and my husband. Thanks for the service. I don’t know what I would do without them. These three are very important (HDM, assisted transport and housekeeping) and I'm very glad I get them because I don't know what I would do without them. Thank you all! I want to thank everyone at the Putnam Aging! I want to thank everyone at the Putnam Aging Program for the service we get and I want to thank the people that bring our meals for the great job they do. They are so nice and we thank Leann so much, she is the best! The food is very good. The people do a very good job. Mike (hometown) does very good with people. I truly love the Hometown Senior Center! I truly love the Hometown Senior Center and all the other seniors and employees there, truly I do. I sure enjoy the meals, helps me so much. 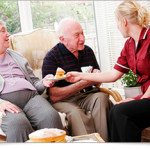 The services provided by Putnam Aging have been a wonderful help to our family. Our FAIR caregiver is wonderful.